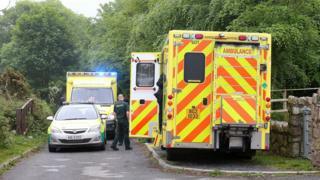 Ambulance waiting times in Northern Ireland have almost doubled in five years. Patients with potentially life-threatening injuries (Category A) could expect to wait an average of 13 minutes and 12 seconds in 2018. This represents a rise of almost 80% on 2013, when the average wait was seven minutes and 23 seconds. The Ambulance Service said there had been an increase in demand without an increase in capacity. In 2017, the average wait for Category A patients was 11 minutes and 26 seconds. Average waiting times for Category B patients (those with serious but not immediately life-threatening injuries) rose by over five minutes between 2017 and 2018, from 17 minutes and 41 seconds to 23 minutes and one second. The figures were obtained by the BBC from the Northern Ireland Ambulance Service and the Health and Social Care Trust. In 2018, the ambulance service held a public consultation into a plan to improve its services, including increasing the number of ambulances and taking on 300 new staff. A UK-wide BBC investigation has found that critically injured patients in rural areas are at risk due to the time taken to reach them. The longest average response time for Category A patients in Northern Ireland in 2018 was more than 27 minutes in the BT22 postcode area - the Ards Peninsula from Newtownards south to Portaferry. The shortest average time - just over nine minutes - was in the BT1 area of central Belfast. Category B patients from the Ards Peninsula also faced the longest average wait, with an average response time of almost 40 minutes. The shortest average time for category B patients - just over 11 minutes - was in BT74, in Enniskillen, County Fermanagh. The Northern Ireland Ambulance Service (NIAS) said it had identified several factors leading to the longer response times, including staff shortages and longer journeys due to the "reconfiguration of acute services". Referring to the recently-completed consultation exercise, a spokesperson said: "NIAS is currently reviewing responses to the consultation proposals in preparation for submitting a final proposal to the Department of Health".